Nobody will disagree that all three sets of Olympic medals in the men’s handball tournament will be handed over to three European teams. In contrast to the women’s tournament no non-European team can hope to break the European dominance. At the past World Championship in Sweden, Argentina was the best non-European team, finishing on twelfth rank. The only non-European team which had won an Olympic medal was Korea at their home games in Seoul in 1988, taking the silver medal. Like in Beijing in 2008, the field of potential medallists or semi-finalists is long. France arrive in London with nearly the same squad that dominated all tournaments from the Olympics 2008 until the World Championship 2011. The French won all these titles and had been the first team in men’s handball to hold all three major titles at once. Despite their surprisingly low performance at the 2012 Men’s EHF EURO in Serbia (rank 11) the team of coach Claude Onesta is still representing absolute world class – and they thrashed Spain, one of their contenders in London, in a test match 31:24. Key factors of their success are the currently best goalkeeper in the World, Thierry Omeyer, the best defence player Didier Dinart, the brilliant genius Nikola Karabatic and the wing phenomenon Luc Abalo. As a huge number of players will finish their international career after the Olympics, France is highly motivated to finish on the podium again. All observers rate Denmark as the main opponent for gold. The Danes won the EHF EURO 2012 and were runners-up of the 2011 World Championship, when France needed an extra-time period to beat the young Northern European squad. In case of winning gold, coach Ulrik Wilbek made history, as back then he would be the first handball coach ever to win an Olympics title with a men’s and a women’s team (Denmark 1996). The Danish squad can count on the currently best player in the world, Mikkel Hansen, and the most talented goalkeeper worldwide, Niklas Landin. Besides the typical strength of the Danes are their counter attacks played by extremely fast wings. But, despite two EHF EURO titles in 2008 and 2012 and several medals at World Championships, the Danish men have never won an Olympic medal before. Denmark will meet the other main contenders in the highly tough Preliminary Round Group B, in which all four semi-finalists of the EHF EURO 2012 will face: The Danes, runners-up Serbia, bronze medallist Croatia and Spain. Especially 1996 and 2004 Olympic champions Croatia and Spain (still waiting for a better Olympic rank than their third place in 1996 and 2008) are aiming high in London. Additionally Hungary and Korea are part of this group, and after beating Serbia in a test match last weekend the Hungarians hope for the quarter-finals, in which the four best ranked teams of each group will face. Furthermore, the big Beijing 2008 sensation, Iceland, hope to repeat their silver medal in London, too. Defending champions France have a quite easy walk in the first stage of the competition, with the re-match of the 2008 Olympic final against Iceland as toughest tasks. The men of host Great Britain are the big underdog in this group and the whole tournament. Sweden are one of the contenders for the knock-out stage, in which either Tunisia or Argentina is expected to be the only non-European team. 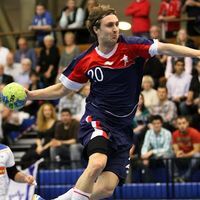 Besides Mikkel Hansen, six former world handball players of the year will be on the court in London: Thierry Omeyer, Nikola Karabatic, Bertrand Gille (all France), Ivano Balic (Croatia), Arpad Sterbik (Serbia-Montenegro, now Spain), Kyung Shin Yoon (Korea). FC Barcelona, record winner of the VELUX EHF Champions League, is the club with the biggest number of players, participating in London (11), followed by MKB Veszprem (9), Atletico Madrid (8), THW Kiel, AG Kobenhavn (both 7), HSV Hamburg, SG Flensburg/Handewitt, MAHB Montpellier (each 6).